uses cookie. By continuing to browse the site, you accept their use for better browsing experience. 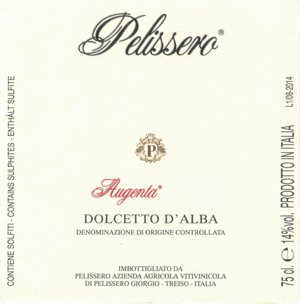 Dolcetto d'Alba Augenta of Pelissero turns out to be every year important wine for structure and complexity. Old warhorse and one of their flagship wines expresses every year at best what are the great potential of Dolcetto. The low yields and suitable climatic conditions allow emphasizing fruit, tannic sweetness and harmony. Before 17,50 € tax incl. Tasting Color - ruby red Scent - delicate, fruity and winey Taste - extremely pleasant sensations ranging between tannic and soft sensations of sweet tannins. Cloth balanced and long finish. Service temperature 16° – 18° C.
Dolcetto d'Alba Augenta of Pelissero is produced in the vineyard surrounding the cellar, in the biggest property of our winery, it is always an important wine thanks to its texture and complexity. Historical flagship wine every year it expresses to its best the great potentialities of Dolcetto grapes. This wine is produced with low yields and in suitable climate conditions, this allows it to exalt fruit, tannic sweetness and a great wine harmony. The dialectal name "Augenta" derives from Latin "Augere" which means "augment", i.e. to make greater as in size, extend or quantity. It seems, as a matter of fact, that long time ago the vines that were cultivated on this side of the hill had superior quality than the average. The grape, coming from predominantly calcareous soil, confers to the wine great complexity. Therefore it needs better attention and an atypical winemaking for Dolcetto grape: 10/12 days of maceration in temperature controlled cask, cold decantation in stainless steel. Finally, the ageing lasts around 6/7 months in oak barrels of 50 hl in order to harmonize the strong tannins given by the soil. Before going out on the market, the wine needs 2 more months ageing in the bottle. Altitude: 400 - 420 m.
Soil: basically calcareous with brown, bluish, very hard and compact rocks, characterized by limited cultivating surface. Our family has always been dedicated to agriculture with a Langa and peasant DNA. We are in Treiso, a township that became independent from Barbaresco in 1957, and which is in the heart of the production zone of one of the top three Italian DOCG, King Nebbiolo. It is the grape varietal that more than any other has defined and will continue to define the history of our hills and of the national and international wine making. We are the heirs of this land and of this vine. The spirit of continuous research in the vineyard, and afterwards in the cellar, plus passion, commitment and innovative dynamism are the firm bases that we combine with the pride of having reached the third generation of viticulturists. Our philosophy has not changed, however: we focus only on original varietals that are typical of our land, particularly Nebbiolo, Barbera and Dolcetto, which make up about 85% of our production. All the grapes that we use come from the 38 hectares that we own. We are able, with the help of knowledgeable colleagues, to directly supervise the entire production cycle, from pruning to marketing of 250,000 bottles every year. Following a road while changing directions, repeating rites while renewing gestures, reinvesting energy while maturing experiences, gathering techniques while sowing evolution. There are new generations, new productive languages and new languages in the Langhe region. English, Macedonian, Japanese, Norwegian, German, Maghrebian: voices and faces from the world that animate the Langhe trails, the vineyards and the cellars together with the people that have been in this land forever, devoting to understand it and loving its generosity as well as its harshness. A duchess in Alba, a count in Grinzane, nobles, marquises and lots of farmers, wine and land ambassadors. Noblemen and commoners of the beloved wine which preserves the art of waiting vintners are experts in among its scents. The choice of the territory, the evaluation of the exposure and the selection of the varietals are however, the very essentials of the wine creation process. Years that pass while observing Nature, planning, caring and learning that no project, care or observation can grasp the essence and the magic. The hands of the vintner are great but the wine vitality is still greater. Vintage, vinification and aging plus soft presses, stainless steel vats, temperature controlled installations and French oak casks. Glass is the material that, in the shape of a bottle or goblet, contains a message that, with the help of Portughese cork, arrives intact in every country to say "Langhe": a thin but intense connecting line that travels along thousands of miles and links years of work to the passion of many. There is a land that moves towards the market and worldly vintners who after months in the fields take to fly though tied to their roots.